Oh man, the holiday season is over! If you’re anything like us, you had an indulgent one and are now ready to get back to it and eat clean. 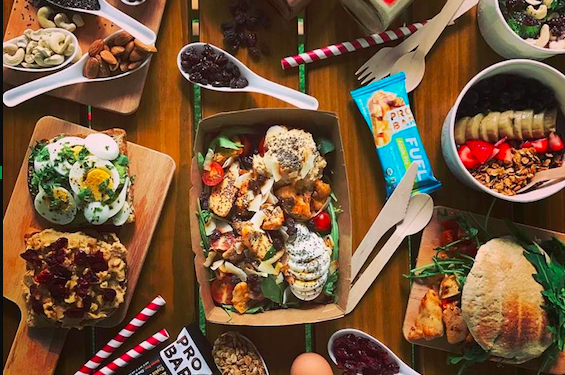 The great thing about working in the CBD is that there are loads of restaurants serving up clean eats just a short walk from the office, many of which will also deliver right to our desks. 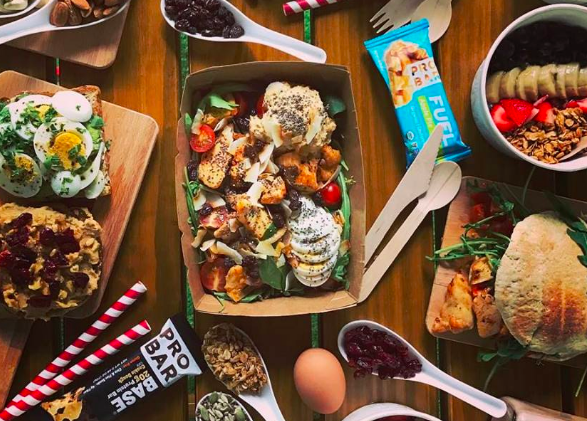 If you’re lookingholesome fare, these are some of our go-to spots when we’re on the hunt for healthy meals. Happy January! 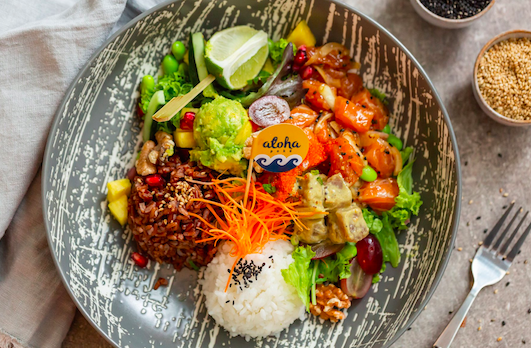 Poke bowls are all the rage right now, and we can thank Aloha Poke for being the first to bring this healthy Hawaiian staple our way. For the uninitiated, a poke bowl consists of cubes of raw fish marinated in soy sauce and sesame oil and tossed with crunchy veg. Aloha Poke also offers variations like wasabi mayo and superfood toppings. Come by for a vibrant lunch bowl in the day, then come back after dark for tiki cocktails and Hawaiian-inspired bites. 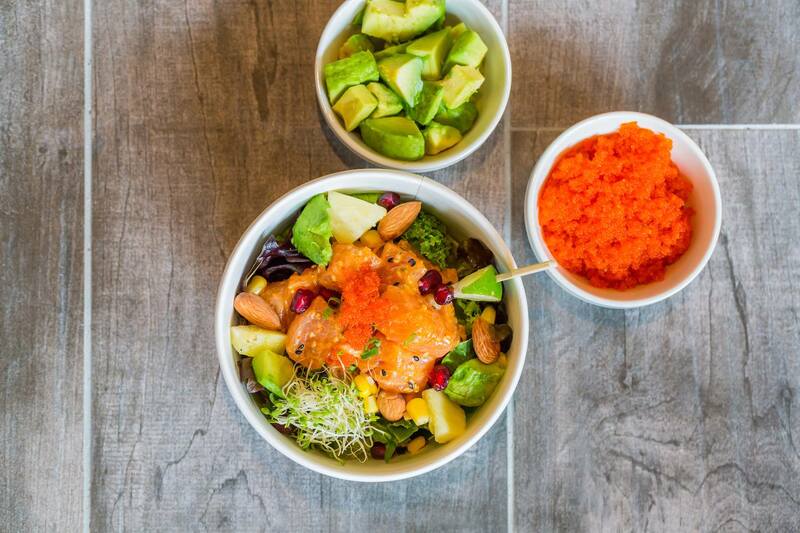 ‘Bangin’ food gone healthy’ is the motto at A Poke Theory, an easy-going spot serving up superfood smoothie bowls, fresh poke bowls, and tasty, nutritious snacks. Head to the counter to construct your own bowl with bases like lemon quinoa or brown rice, a main flavour like fresh salmon, tuna, or avocado, and toppings like crunchy corn and crispy salmon skin. Pair it with a cold-pressed juice, and you’ll be feeling like a whole new you in no time. Avocado is the name of the game here. Head in anytime to enjoy hearty and delicious meals which all contain avocado. In the morning hours you’ll find breakfast dishes like the Goodfellas – smashed avocado, feta, rocket sourdough and afternoons call for fresh salads and sandwiches. 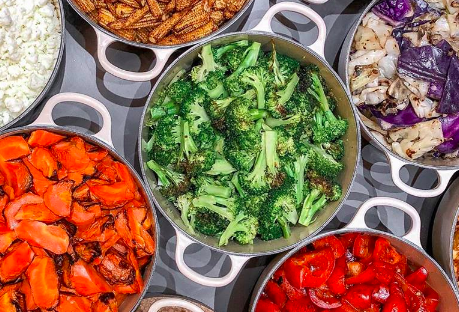 The Daily Cut takes the DIY salad bar concept and amps it up with tons of hearty protein options like Thai skirt steak, orange glazed salmon, and rosemary chicken breast, plus enticing add-ons like sous vide egg, baby corn, and purple sweet potato. Ordering is simple, just grab a menu card and tick the boxes, then the staff will whip you up a custom creation. This is a great spot for a quick-takeaway when you’re in a rush. They can also deliver right to your office or home via some delivery apps. Our hunger pangs are usually very satisfied after a lunch at The Daily Cut making it one of our top picks. If you love your salads, you will love choosing from the ingredients that are served up here like green beans, brocolli, cucumber, brown rice, smoked chicken and so much more. Make your own salads or sandwiches or choose from their delicious creations all paired with homemade dressing like our favourite, sundriend tomato. The atmosphere is cosy at Gran Traders, which makes it a great place to pop into for a morning coffee and acai bowl or an easy-going lunch that will fuel you up for the rest of the day. The build-your-own-bowl option is great because you can load up on your favourite grains, protein, veg, sauces, and toppings, but if you’re pressed for time, try one of the signature bowls like the Mawashi with tuna tataki, wild mushroom confit, green papaya coleslaw, and pickles on cold soba noodles. Haakon takes traditional Scandinavian fare and gives it a superfood twist with simple, honest dishes made with fresh, natural ingredients. Come by in the morning for an acai bowl, buckwheat pancakes, and a spirulina smoothie, or or stop by at lunch for nourishing plates like the salmon zoodles, avocado vegan bowl, or gourmet meatballs on sweet potato mash. They also brew stellar coffee if you’re looking for a quick java fix. Vegans in the know head to HRVST at OUE Downtown Gallery for creative meat-free eats in a beautiful setting. The lifestyle space is equipped with a restaurant and outdoor bar (psst…they have great happy hour options) and a yoga studio which means you can get in a good workout work, then refuel with nutritious, plant-based eats outdoors in the gardn. And if you nail down an extra hard workout, we reckon there’s no harm in rewarding yourself with a few G&Ts or pints, we won’t tell. If food sensitivities are the bane of your existence, then Kitchen by Food Rebel is your spot. 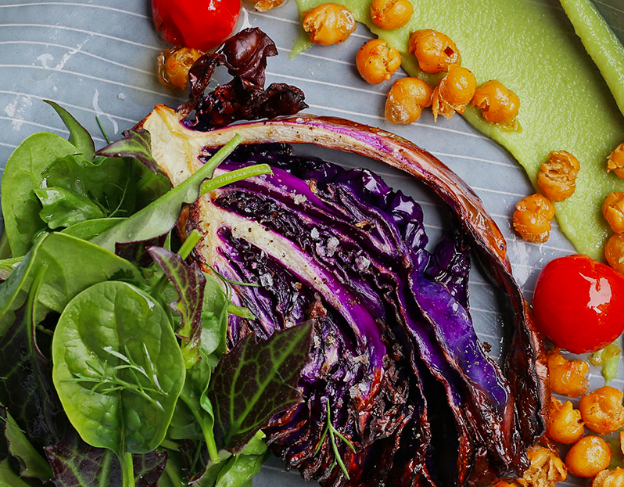 The focus here is on ultra clean eating with gluten-free, dairy-free, and nut-free dishes made with organic, sustainably sourced ingredients. Some of our faves here include the zoodle bolognese (swap out the meat for chickpeas to make it vegan) and the organic tofu and creamy avocado sandwich. Located on Robinson Road, this healthy-eating hangout specialises in shakes packed with nourishing ingredients. There’s something to to suit all sorts including diet shakes for slimming down, protein shakes for bulking up, and coffee shakes for when you need your caffeine fix. They also have a great selection of eats including DIY bowls, multi-grain toasts with healthy toppings, and pitas packed with proteins and veggies. Just like the name suggests, Healthy Soba IKI focuses on soba noodles handmade fresh in house with buckwheat flour flown in from Japan. Go for a refreshing bowl of cold noodles topped with your choice of duck, eggplant, or egg and tomato, or warm up on a rainy day with a steaming bowl of hot herbal chicken soba. There are also hearty rice bowls and curry sets on offer. Everything about this DIY salad spot is down-to-earth, from the wholesome, nutritious ingredients to the no-frills decor, and the easy ordering system. Just grab a form, choose your salad size, pick your toppings and dressing, and you’re good to go. Tasty adds include crunchy cashews, prawns, and avocado, and you can opt for dressings like the blue cheese or sun-dried tomato vinaigrette. SaladStop! 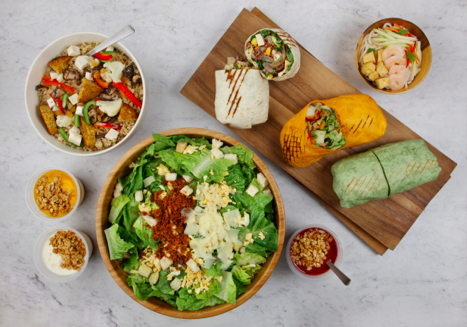 officially opened its doors nine years ago to great fanfare, and has since gone on to become one of the biggest healthy food chains in Asia with 19 outlets in Singapore and more than 20 outlets across the region. The key here is fresh, quality ingredients from partner farms and locally inspired dressings that change with the seasons. You can create your own salads, wraps, and grain bowls or go for one of their colourful concoctions. 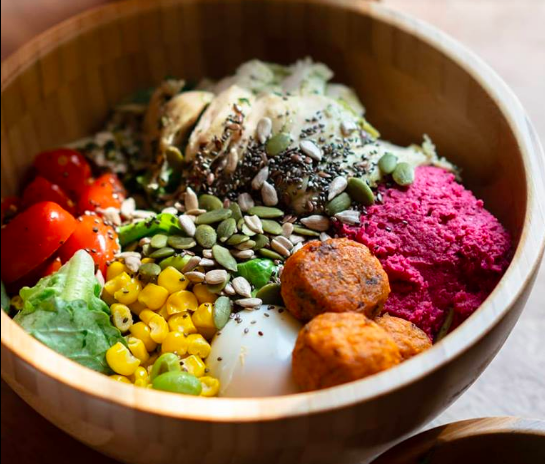 We’re huge fans of the tasty Mediterranean cuisine at Blu Kouzina, so we were stoked when we heard they offered healthy delivery concept offering vibrant bowls brimming with greens, grains, proteins, and dips. Each handcrafted bowl has been analysed by nutritionists to ensure that they’re packed full of vitamins, which is great if you’re trying to amp up your nuntrients. Fancy some wine with your meal? They also deliver organic wines by the bottle. Looking for something a bit different than the usual salads and smoothie bowls? Wafuken focuses on sous vide food, so all of the proteins are slow-steamed in vacuum-sealed packs rather than fried or grilled. 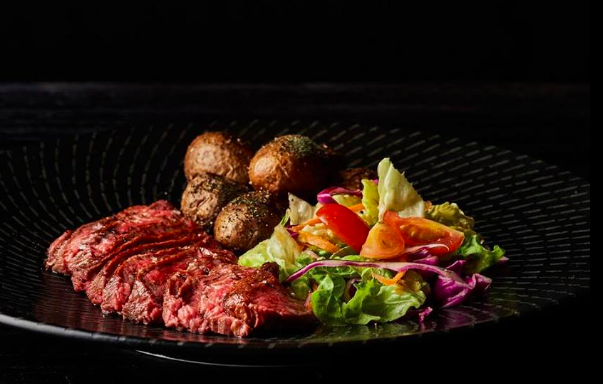 Take your pick of tender, juicy meat like smoked duck, dory, or wagyu rump and pair it with low-calorie sides like steamed veggies or cold soba noodles. Wheat BaumKuchen is wildly popular with the CBD lunch set for their fresh Asian-inspired dishes made with wholesome ingredients. Their specialty is homemade soba noodles, which they use in dishes like the Penguin with green soba, shredded chicken, and quail eggs. You can also opt for rice dishes like the salmon poke with red rice, tasty salads with grilled fish and meats, or go for quinoa topped with grilled chicken, broccoli, and salad. Searching for healthy halal food? Look no further than YOLO, a contemporary spot serving up vibrant halal soups, salads, and protein bowls. They also have a great selection of vegan and GF offerings. Try one of the signature bowls designed for lifestyle goals like slimming down, shaping up, and amping energy, or create your own bowl to suit your tastes. And for those days when you just can’t escape the office, YOLO also delivers.